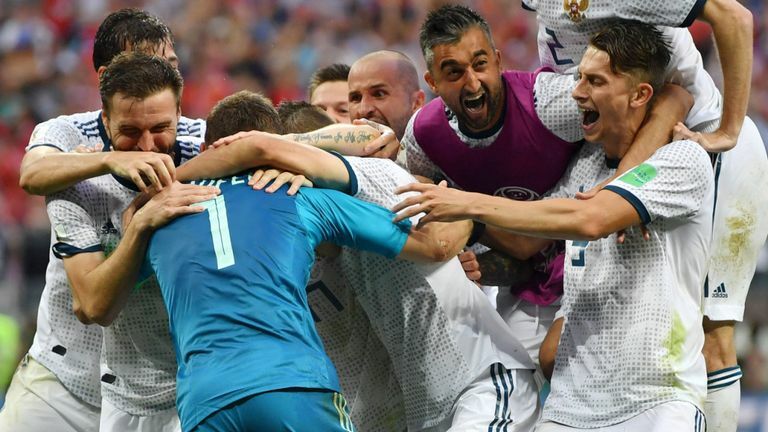 Igor Akinfeev was the hero as Russia reached the World Cup quarter-finals in dramatic fashion with a 4-3 penalty shootout win over Spain. Akinfeev saved spot-kicks from Koke and Iago Aspas during a nerve-jangling finale at Moscow's Luzhniki Stadium as the delirious hosts ousted the 2010 champions and booked a last-eight showdown with Croatia or Denmark. Sergei Ignashevich had unwittingly handed the 2010 champions a 12th-minute lead after tussling with Sergio Ramos, only for Artem Dzyuba to cancel out the own goal with a well-struck penalty (41) after Gerard Pique was punished for handball. But stalemate ensued between a defensively-minded Russian side and a Spanish one whose prolonged possession was slow-paced and short on risk, Fernando Hierro's men eventually paying the price. Long before the fevered finale, Russia had plumped for containment but they broke quickly when the chance came, Golovin with a promising early dart down the right that raised the volume. Space squeezed, set-pieces looked a likely way through and when Marco Asensio swung in from the right-hand edge of the box, Ignashevich was too busy wrestling Ramos to clear the danger, the ball bouncing into the net off his calf.